I’ve teamed up with Morningstar and BlogHer to bring you this post. So there you have it. The verdict of my official recipe-tester. So now the challenge is on you: Judge for yourself! Make this fabulous meatless dish and then come back and tell us what you think! Wholesome eating has always played a central part of my life. I married a physician and we continue to emphasize a healthy lifestyle (with the occasional indulgences for sanity sake – that’s where my philosophy as a mental health counselor comes in). And especially now that we have children, eating healthy is a priority. Not just in terms of what we do eat, but what we don’t eat. And that includes meat. We’re not vegetarians, but we do limit our meat intake and regularly incorporate meatless meals in our diet. I’ve tried a variety of brands that feature meatless options and what I’ve found all too often is that with many meatless products you end up sacrificing flavor and texture. That has not been my experience with MorningStar Farms. Not only do they have a “clean” ingredients list (which is super important to me) and come packed with protein, their products taste great! And they’re very versatile in the wide range of meals you can make with them. With over 30 different products and over 600 recipes, MorningStar Farms offers more ways to eat smart. Their vegetarian products come in the form of patties and links, but no need to limit yourself to… patties and links. The sky’s the limit in terms of what you can create with them. You just need to think outside the box (or scroll through their vast collection of recipes). To give you a few examples, I recently used their Spicy Black Bean Burger patties to make a quick, healthy, satisfying, meatless Southwestern salad. I cut the patties into strips like I would with chicken, grilled them in the toaster oven, and then served them on a bed of lettuce with kidney beans, corn, and a spicy creamy Southwestern dressing. Another way I like to incorporate them into a meatless meal is to make breakfast burritos. I dice up the Spicy Black Bean Burger patties, scramble some eggs, saute some bell peppers and onions with spices, fry up some hash browns, and then assemble all of the goodness into a burrito shell, top it off with some salsa and sour cream, and roll it on up! One product, so many ways to use it. Or, have you tried their Mediterranean Chickpea Burger? Slice it into strips and fry it up with onions, garlic and Greek seasoning, pile it into some fresh pita or flatbread with shredded lettuce, red cabbage and red onions, top it off with fresh tzatiki sauce and – voila! – you’ve got yourself a healthy, tasty vegetarian gyros! MorningStar Farms is constantly creating new products and flavors and has recently introduced include their Roasted Garlic & Quinoa Burger, Buffalo Chik Patties, and Parmesan Garlic Wings. Today I’m going to share a classic comfort dish that’s quick and easy to make and uses MorningStar Farms Original Veggie Sausage Patties. 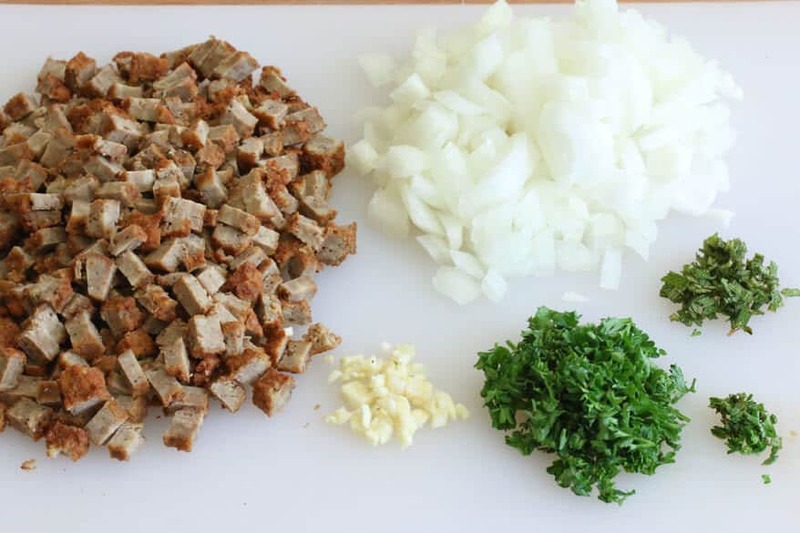 Finely chop up the veggie sausages, onion, garlic, parsley, sage and thyme. 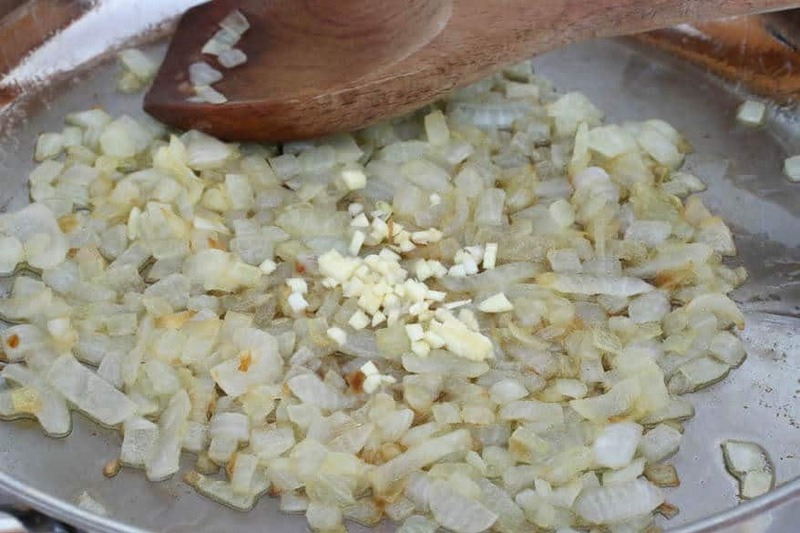 Heat the butter in a skillet over medium-high heat and cook the onions 8-10 minutes until golden and beginning to brown. 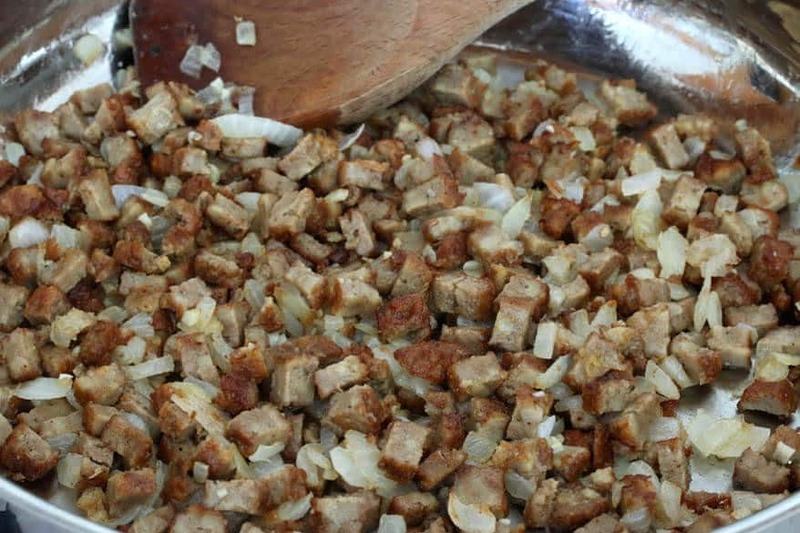 Add the veggie sausage and cook for 4-5 minutes until lightly browned. Sprinkle the flour over the mixture, stir to incorporate, and cook for a minute. 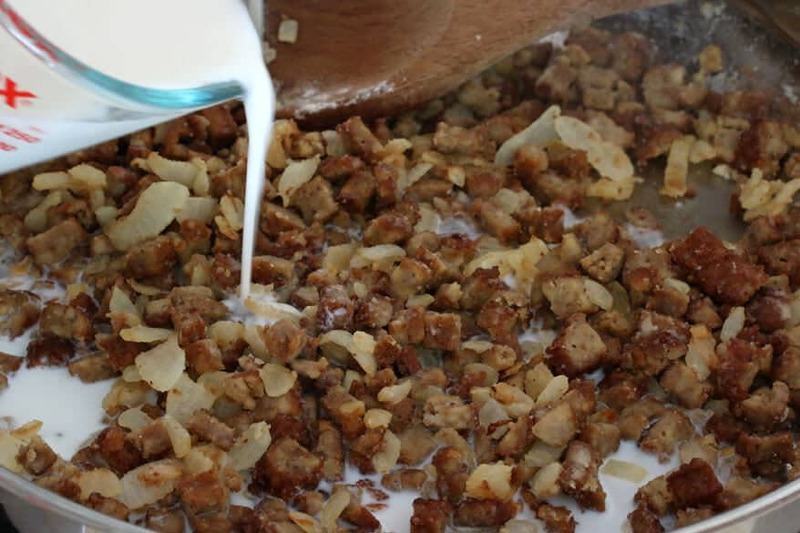 Pour in the milk (and heavy cream, if using), stirring constantly to prevent lumps. Stir until smooth and add the vegetable bouillon, salt, pepper and cayenne. Bring to a simmer, stirring regularly, and cook until the sauce is thickened. Add the parsley, sage and thyme and simmer for another minute. Add salt and pepper to taste. 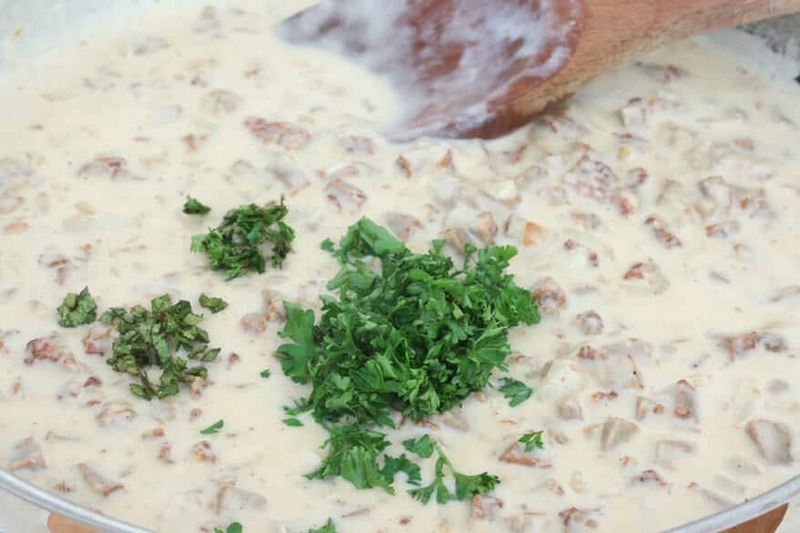 Serve immediately over freshly baked biscuits and garnish with chopped fresh parsley. 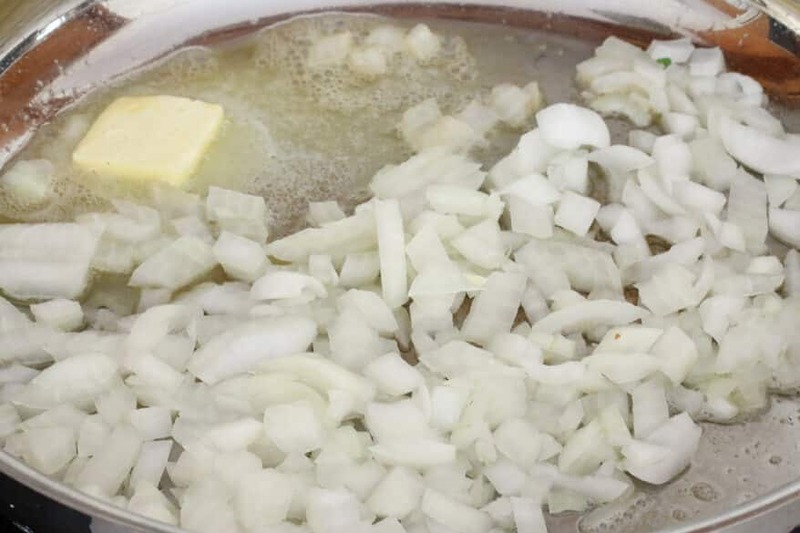 Heat the butter in a medium skillet over medium-high heat and cook the onions 8-10 minutes until golden and beginning to brown. Add the garlic and cook for another minute. Add the veggie sausage and cook for another 3-4 minutes. Sprinkle the flour over the mixture and stir to incorporate, cooking for another minute. 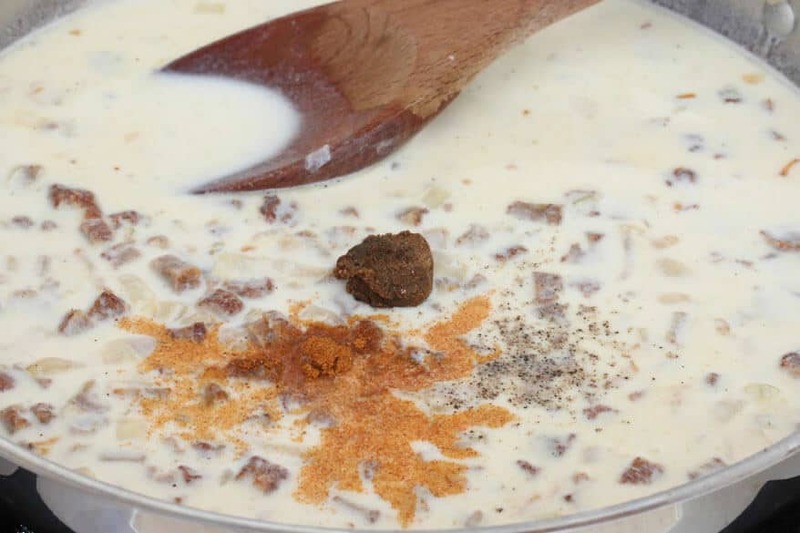 While stirring constantly to prevent lumps, pour in the milk and heavy cream. Stir until smooth. Add the vegetable bouillon, salt, pepper and cayenne. Bring to a simmer and stir until thickened. Add the parsley, sage and thyme and simmer for another 2 minutes. Add salt and pepper to taste. Serve immediately over the biscuits. Garnish with some chopped fresh parsley. I don’t eat pork, so I love Morningstar Farms sausages. I’d love to try this recipe with them! I’d make the Mediterranean Chickpea Burgers with a salad for a summer meal. I would love to make a pasta dish with these vegetarian products! 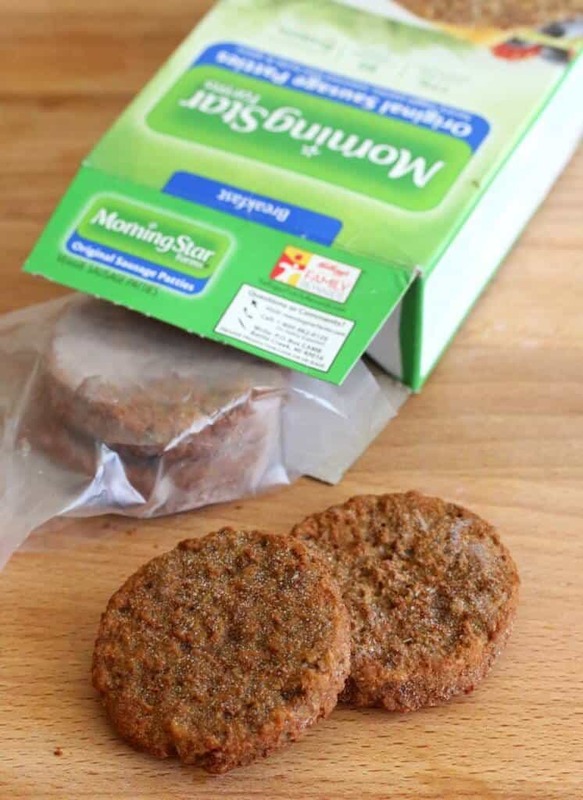 I would use 2 1 (8 ounce) package Morningstar Farms Original Veggie Sausage Patties to create my Sausage Casserole that I make often. It is easy to make and I use onions, eggs, cheese and shredded potatoes. I would use these sausage patties to make an English muffin breakfast sandwich! I would like to try the veggie sausages in my sausage and egg casserole. 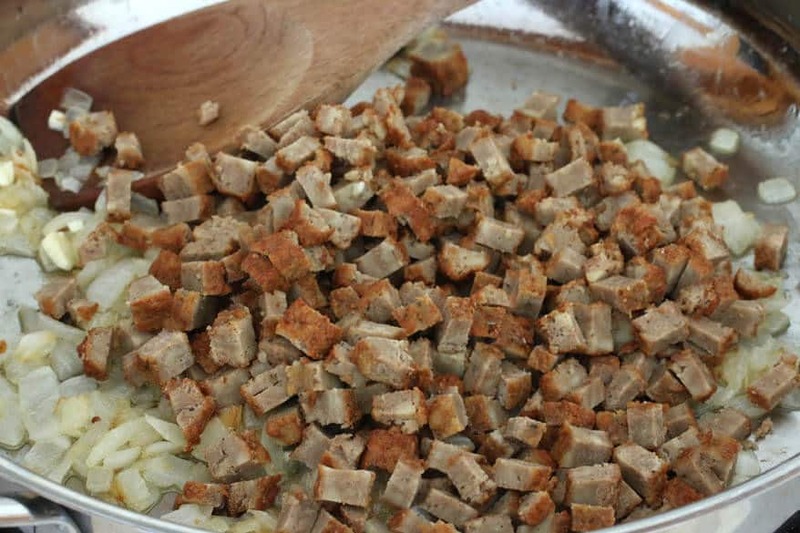 I’m going to try using Morning Star sausage and diced potatoes to make something similar to a hash. I would create veggie pita pockets using the Mediterranean Chickpea Burgers. I would use the MorningStar sausage to make my Breakfast Sausage Bake. It has cheese, onions and hashbrowns and MorningStar sausage.. I like using MorningStar sausage because it is so much healthier than regular sausage. I would use the veggie sausage on a pizza. They have so many yummy things to try! I want to try the MorningStar Farms® Baja Black Bean Pizza. I would use Morningstar Farms Meal Starters Grillers Recipe Crumbles to make chili. 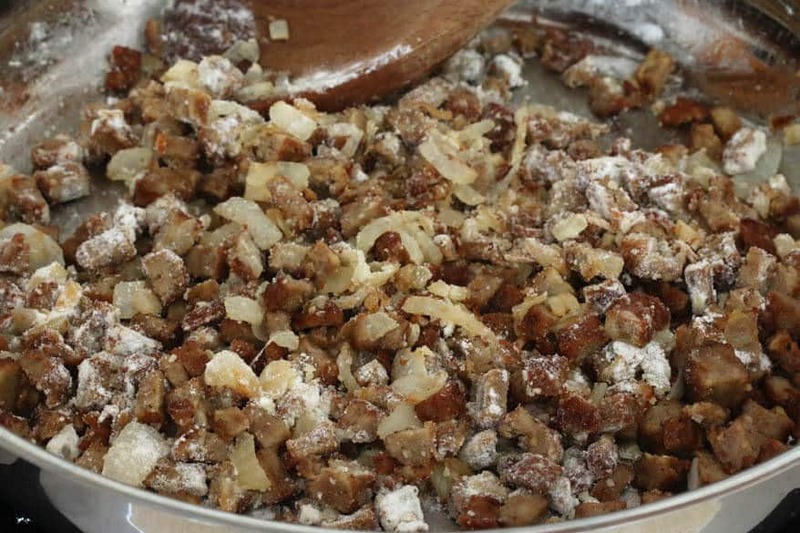 I would love to try this in my stuffing recipe, in lieu of sausage! Looks relish! I would make breakfast sandwiches with Morning Star products. I like to take the Black Bean Chipotle ones and cut them up into a spinach salad with avocado. I would use the Morningstar Farms Meal Starters Grillers Recipe Crumbles to make delicious taco filling and add sauce, onions, peppers and tomatoes. I would like to make sausage balls using this. My family would love that! I would chop up the Morningstar Farms sausage patties for a pizza topping. I’d use Veggie Burgers make some veggies wraps. I top my salad with chopped Morningstar Buffalo Chik’n Nuggets, wheat rotini, and southwest salad dressing. YUM! I would cut up the MorningStar Farms® Original Sausage Patties and use them in a sausage and cheese omelet. Always looking for something healthy for breakfast with my granddaughter. I could make some awesome sandwiches for her with these! I eat several Morningstar Farms products and LOVE THEM! My favorite is the Mediterranean Chickpea burger. I zap it in the micro for 30 seconds, then slice it up and add to scrambled egg whites & herbs, topped with a tbsp. of parm cheese and fresh parsley & diced grape tomatoes from my garden. YUMMO! Breakfast burger on an English muffin with scrambled eggs and ketchup. I would use the garden bugger for a breakfast quiche….add some eggs, cheese, and potatoes – yumm! I would create a meal for my family using morningstar original vegi burgers. i would take the morning star veggie burgers with some salad and rice on the side!!!! Cool recipe, looks delicious. I would use morning star to make a veggie version of Sloppy Joes. I would love to make a stuffed cheesy pasta shell with they’re meat. I would like to try to make some type of meatloaf with the black bean burger. I like to use the morningstar bacon with my eggs. It gets crispy just like real bacon, but without all the grease and fat. I would love to try the MorningStar Farms® Mediterranean Chickpea Pizza. I’d use their Chik’n Nuggets for an easy meal with BBQ sauce to dip, corn on the cob, and watermelon. I would like to try the black bean burger, crumbled, then mixed with sautéed onions, garlic and rolled into a steamed cabbage leaf, topped with yogurt sauce with spices and mint leaves. I would like to have MorningStar Farms® Breakfast Sandwich Sausage Egg and Cheese for breakfast. 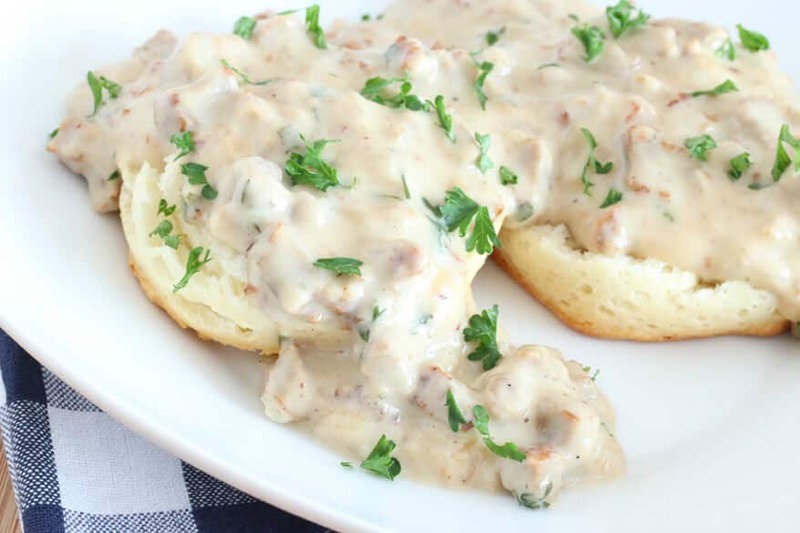 This sausage gravy looks fab! Would love to try any of the burgers crumbled up into a salad. I’d probably use some of their chopped up patties in a taco. We find they are easy to top with so many different options. I would replace ground beef with the morningstar crumbles in my spaghetti sauce. I tweeted under twitter id @yarbr012: https://twitter.com/yarbr012/status/474704361398886400. I have had the Morningstar Farms Chik Patties before and I love them! Great chicken substitute! They taste just like it!! Would love to try the buffalo flavor patties. I would make some of their buffalo products because our family lives spicy food! I’d crumble up the black bean burgers and use them in tacos. I’d make a blt with the veggie bacon strips. Love the recipe, looks great – but just an FYI on Morningstar – They are owned by Kellogg which uses Monsanto seed for the majority of it’s products, so it is a GMO product and not a clean source. My family loves my vegetarian beef stew that I make using the Morningstar BBQ ribs. I remove the sauce from them chop them and sautee them before adding to my stew. Made tonight – I cook “fancy” recipes periodically that take lots of ingredients and a long time..and I always say, “It’s good, but how can it be better? More spice, more citrus, veggies a little crispy?” This one? 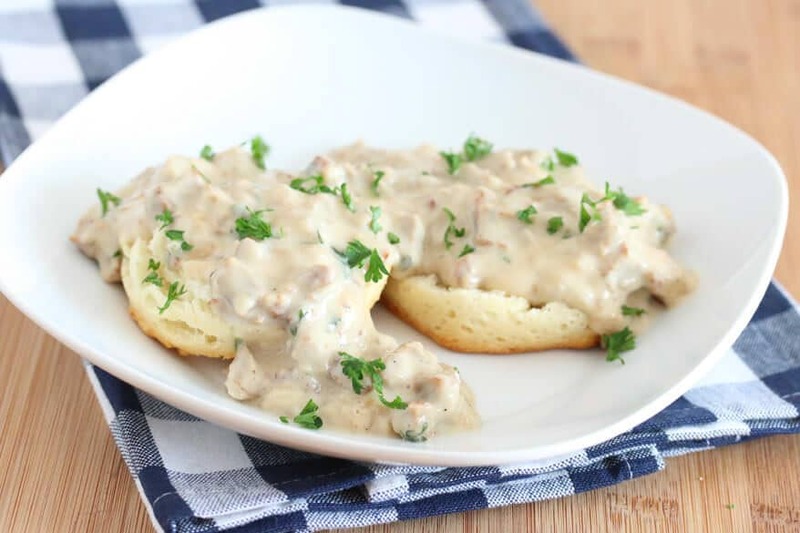 I tasted and verbatim: “Oh my god, this is really good.” Omnivorous husband said it was maybe the best biscuits and gravy he had ever had. Coming from Georgians, mind you. Definitely a win – great flavor. Wonderful! And yes, that is especially flattering coming from Georgians :) I’m so glad this was a hit, Lynx, and really appreciate the feedback, thank you! I just made this with homemade biscuits for my husband’s birthday breakfast and – WOW. I honestly cannot believe how great it tasted. I used Field Roast breakfast sausage and otherwise followed the recipe exactly. My husband literally licked his plate clean, and I wasn’t far behind him! This is the best gravy I’ve ever had, veggie or otherwise. Awesome, Stephanie, you’ve made my day – thank you! :) That sounds like the perfect birthday breakfast and I’m thrilled you and your husband enjoyed it so much! I walked off meat two months ago and so far have found great replacements for so many favorites. 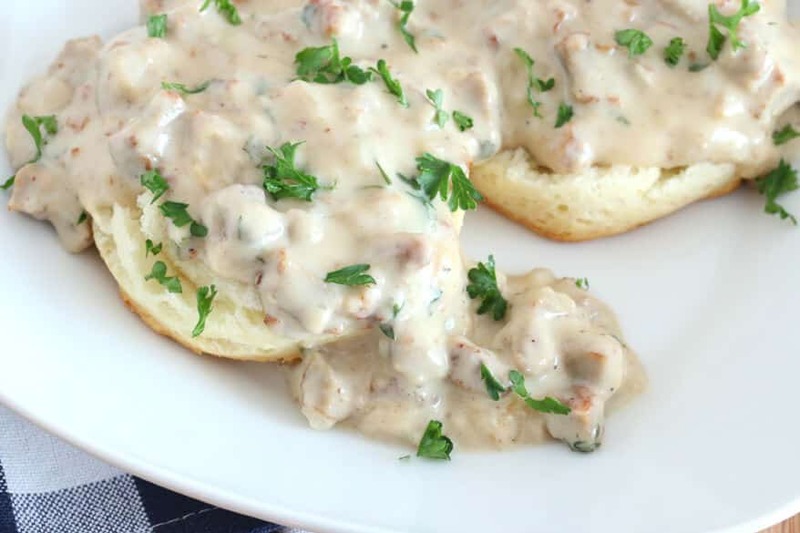 My husband loves biscuits and gravy so this gives me hope! Thanks for the good ideas. WOW! What a REALLY good recipe!! !